The traditional cottage garden border is always thought to be at its best in mid-spring and early summer, with an abundance of bees and butterflies happily buzzing around. Whilst this is true, it is possible to extend the season of colour well into the autumn and provide some very important food for the insects. In my own garden I seem to have achieved this better in the front garden than the back; it is the combination of perennial grasses, sedums and a purple aster (I can’t even remember where it came from) that makes a really lovely display right up until the first frosts. This display is not only a great thing for me to enjoy but it also has a number of functions to help the local wildlife – the nectar provided by these late flowering perennials is of vital importance to insects preparing to hibernate, as it literally provides a sugar fix before they wind up for the winter. The older varieties of cottage garden perennial are better for this than the newer hybrids as they contain more nectar. I also leave the heads on the grasses and this provides hiding places for insects and a feed source for birds, so don’t try to be too tidy as you put your garden to bed for the winter. I thought I would give you a list of my top six plants in this category so that you can plan your own border next year. This is a lovely plant, sometimes called ‘Black-eyed Susan’ due to the lovely dark brown to black cones in the centre of the bright yellow daisy-like flower. A really good variety is Rudbeckia fulgida ‘Goldstrum’. This has strong leaves and upright growth reaching a height of about 75cm in the border; it needs a little moisture at the roots and full sun. This is another daisy-shaped flower with a brown cone and it comes in many different shades of pink through to white. 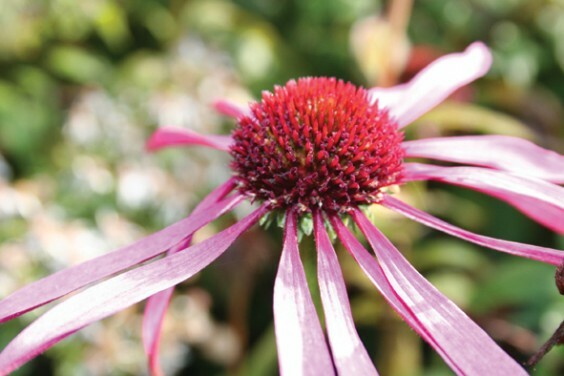 A good specimen is Echinacea purpurea ‘Robert Bloom’, and it is also known as a treatment to aid the immune system particularly against colds and flu. For a white version try Echinacea purpurea Alba – either one will attract plenty of butterflies and bees. I love this plant – it may well be one of my most favourite! It has flat heads that are light mauve to purple and gets absolutely covered in bees and butterflies; the stem is box-shaped and this helps it to stand up tall but gives it a lovely airy feel in the border. It self seeds freely and looks superb with taller perennial grasses. A must-have! Sometimes known as Montbretia, I know lots of people think this is common as muck, but for me it does have a place in the autumn garden if used well. On a recent visit to Cornwall I saw whole walls covered in their native version and it looked fabulous. If you are bored with the orange one, try a yellow variety like Crocosmia ‘Citronella’ – it grows from a bulb just about anywhere but will need some sun to flower and it spreads rapidly. These smaller daisy flowers are traditionally a deep purple like the one in my garden, but there are so many new types available. They are very easy to grow and just need splitting every three years or so to keep the flowers coming through strongly. I have two favourites: Aster x frikartii ‘Monch’ with its pale lavender flowers or, for a softer effect, Aster lateriflorus ‘Horizontalis’ – this has tiny pink tinged flowers with a darker centre. Either will have your borders buzzing with grateful insects. Last but by no means least, for a really wow factor of colour try the Helenium flowers. These are again in the yellow palette but have been bred to deep oranges and browns, and if used well in a colour scheme they can be really exciting. Most of these plants should be readily available at your local garden centre or online, and by adding them into your borders you will not only be giving yourself a boost of colour well into autumn – you’ll be helping your local wildlife too.